There’s something about V-twins that attracts motorcycle lovers. Be it Harley-Davidson or Ducati, two cylinders sprouting under the tank does a fair bit to rouse two-wheeled passions. It goes without saying that the bigger the twins, the better. And, few people do big twins like Moto Morini can. Moto Morini comes from the land of scarlet cars and bikes, Italy, and is situated in Bologna, making it a neighbour to Ducati. Founded in 1937 by Alfonso Morini, Moto Morini has seen its existence decorated with successful competition history, interruptions from the two World Wars and a host of ownership changes, before finally gaining stability in 2012. It’s been making V-twins since the early 1970s, and given how long it’s been around, Moto Morini knows a thing or two about making motorcycles. And, they are gloriously Italian, I assure you. Moto Morini announced its entry into India at the 2014 Auto Expo with Mumbai-based custom motorcycle builders, Vardenchi Motorcycles, as its official distributors. Vardenchi is famous for its Royal Enfield-based custom bikes of every conceivable shape and size, and it’s also working on a neo-retro cruiser platform using the 1200cc motor from Moto Morini. However, while that’s going to take a while to become reality, Moto Morini has launched two motorcycles in India — the Granpasso 1200 and the Scrambler 1200 .Let’s see what they’re all about, shall we? The Granpasso might share its V-twin heart with the Scramble, but the two couldn’t be more different. This motorcycle is much more sophisticated, a bike that craves to cover long distances as rapidly as possible. The Granpasso is made up of essentially the same components that make the Scrambler, but with key differences that make it an entirely different animal. It begins, of course, with the looks. The Granpasso looks like a really angry predatory bird, what with its beak pointing threateningly at you, while it stares hard with its two projector headlamps. The tall windscreen is meant to keep wind away from you. It does manage to do this, but it needs to be adjusted for your height or your head will be buffeted until it falls off your shoulders. The seat is a supremely comfortable unit, and the riding position is an upright and roomy one. Getting on this bike isn’t very intimidating, and Moto Morini has tuned the 1187cc motor to make the same amount of power as the Scrambler. But, it makes it in a very friendly way. Make no mistake — the Granpasso will hoist its front wheel given half a chance, but it never feels like it’s out to get its rider into trouble. Every throttle input results in rapid forward progress without much drama. Much of this friendly nature is down to the longer-travel suspension, plush seat and proper road-biased sticky tyres. Handling this big bike is not a problem at all, and you take little time in getting used to hustling it along in fast traffic. The immense torque, though, does require you to maintain a careful right hand around town. Don’t want to pull involuntary wheelies right past a waiting policeman, do you? 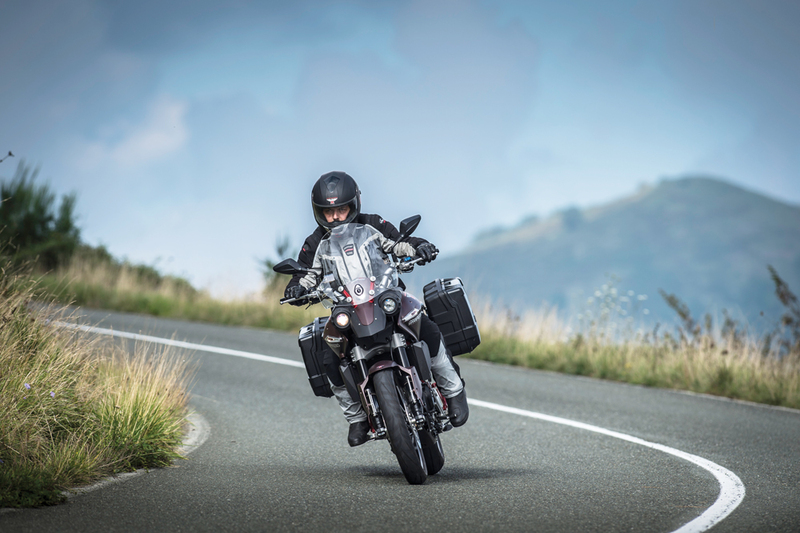 As far as adventure-tourers go, the Granpasso is a decidedly road-biased one, more in the steps of the Ducati Multistrada than the BMW R 1200 GS. Even so, it’s a great alternative to the other bikes in this segment, especially since you’re guaranteed exclusivity with Moto Morini. And, yes, you can tell your friends you’ve got a big Italian V-twin too. Only it isn’t a Ducati. At Rs 27 lakh, ex-showroom, the Granpasso is far from being a cheap motorcycle. Ridiculous taxes imposed on imported bikes make it well nigh unreachable for most of us. But, if you need a bike that can cross the country without breaking into a sweat, why not check this one out? Now here’s a motorcycle that is pure testosterone on two wheels. It’s got the size and aggression that’d make a silverback gorilla think twice before approaching it. The Scrambler 1200 is a brutishly handsome motorcycle that towers over everything around it. Now, scramblers are supposed to be lithe and sturdy motorcycles that thrive off the road. However, though the Scrambler comes with tyres that look like they mean business on dirt, it’s highly advisable that you know what you’re doing with this one — after all, it does weigh 200 kilograms (without fuel). One thing you don’t have to worry about, though, is power. The Scrambler, with its 1187cc V-twin that produces 115 bhp and a mighty 10.7 kg, is a roaring motorcycling concert at which riotous torque is at full head-banging attendance. There is nothing delicate about this motorcycle — if it was a guy, it’d be half Rambo and half Punisher. Essentially, full mad, something you don’t want to mess around with. Swinging a leg over the Scrambler has even a six-footer respect how high this iron horse’s saddle is. Everything on this bike is hero-sized — the trellis frame looks like it could support bridges, the front 19-inch wheel adds to the tremendous road presence and the suspension looks like it could soak up lunar craters. 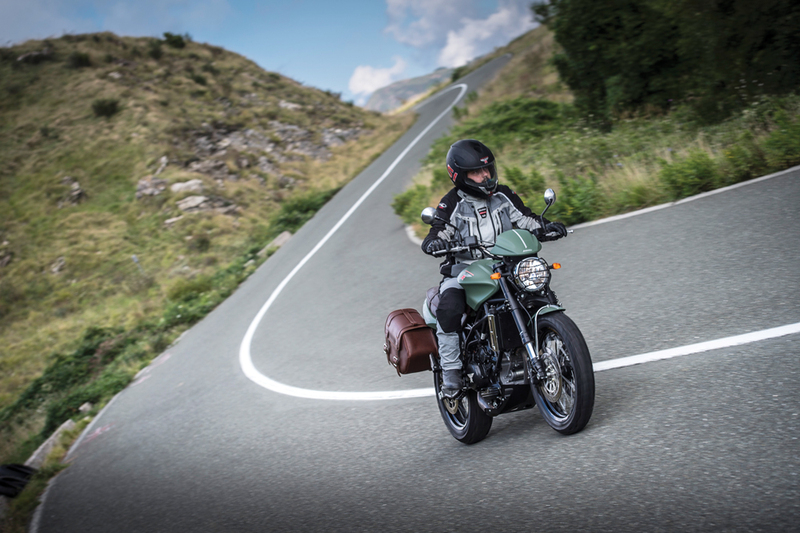 The lordly riding stance is quite comfortable, and once you get moving, you really don’t feel the Scrambler’s heft. All you feel is invincible torque. The motor is a bit hesitant up to 3000 rpm, but that’s only relatively speaking. A 1187cc motor cannot be termed as hesitant. It’s probably Indian fuel quality that makes the Scrambler lurch around below said rpm figure. Once past that, though, it charges forward like an angry rhino, making short work of shifting through the six-speed gearbox. Every time you’re halfway playful with the throttle, the Scrambler’s front wheel wants to reach for the sky, even as the rear wheel scrabbles around for grip. It is sensory overload at its best. By the time you’ve redlined third gear, the speedometer’s reading a not-so-insignificant 160 kph. Thank god, the bike can handle it. The Scrambler’s brakes and suspension are more than up to the task of hauling it down from serious speeds. However, the knobby tyres do give cause for worry on concrete roads, and one has to be careful with how much to trust them. On tarmac, though, the Scrambler takes everything you can throw at it, and then some. However, all of this Italian madness comes at a seriously maddening price. If you want to take this badass machine home, you’ll need Rs 24 lakh worth of loose change, and that’s the ex-showroom price. However, one has to ask the question — can you put a price on absolute cool and mad times? If you have recently inherited a fortune or have pulled off a heist, you can’t really go wrong with this motorcycle. If not, then take a deep sigh in tribute of the fact that this motorcycle exists.